Oribe Dry Texturizing Spray is really worth the hype. I was incredibly wary of spending so much on a hair product, but after a good bit of research, I decided that I wouldn’t be using too much of it at a time and I should just take the plunge. Glad I did. It’s a blowout in a bottle. These Warby Parker Everett Sunglasses are a pretty little number, aren’t they? I think the tortoise shell frame is perfect and the price is great for high end shades. Double eyeliner is super trendy right now. What does this mean exactly? Create a cat eye flick with your normal eyeliner (I always use black), then add a thin strip of a a colored liner on top of it. Like this. My pick is this gorgeous emerald green liquid liner by Revlon. It adds the best hint of color without being too over the top. And I love emerald everything. 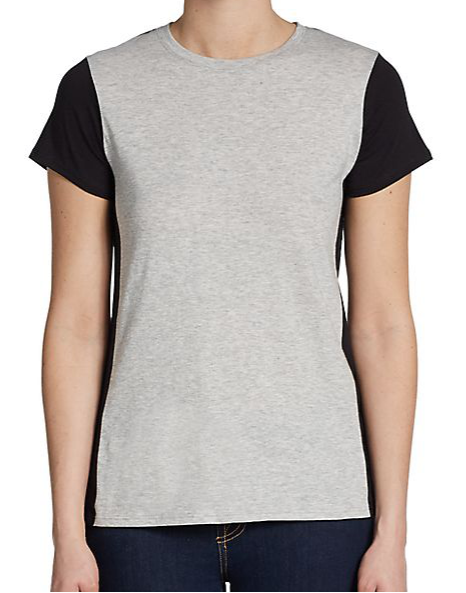 I mentioned this Vince Colorblock Tee in yesterday’s post, but it’s such a favorite that I’ve got to mention it again. It’s been marked down from $68 to $30! The grey + black combo is perfection and the placement of the blocks is super slimming. High end tees last longer, they hit you in all the right places, and the fabric …oh the fabric. So soft. Without a doubt, my current favorite jewelry shop is Layered and Long. I now own quite a few pieces and couldn’t possibly decide which one I like best. Each piece is thoughtfully made, dainty, and perfect for layering. You can also get most pieces personalized, which makes the jewelry so meaningful (great gift idea!). Save 10% off your purchase with code SWANKY10. Next Post …and I'm off! I've had the Oribe spray in my Amazon shopping cart forevvvvvvver. I'm gonna bite the bullet!